Susan Raye just has some best of cds on the market so I decided to review an album of hers. This was her first. I didn't care for the title song but the other songs were all right. 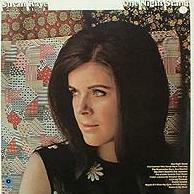 Susan was Buck Owens' protege in the 70's. They even did some duet albums together. He wrote some of the songs on this album. Susan usually got perky material. Although this album does have some perky songs like an ok cover of Put a little love in your heart what surprised me most about this album was how rural Susan sounds. She kind of sounds like Kay Adams, a Bakersfield artist as well, who recorded in the 60's. Kay was on The Buck Owens show sometimes so this comparison is not too surprising. Susan would make more of a sound for herself as the albums went by but this is a pretty good debut.